Wisbech Ladies celebrate their East Division One North title success. Photo: Lisa Williamson. Wisbech Ladies have won the East Division One North title after drawing their final game at Blueharts 1-1 yesterday (March 19). The point was enough for Wisbech to finish one point clear of Norwich City who are also promoted. Charlie Paine opened the scoring for Wisbech before the home side equalised. Wisbech won four and drew one of their final five matches to win a very competitive division. 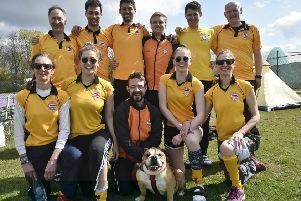 City of Peterborough lost their final match of the season 4-2 at home to Bedeford seconds, but they can still be proud of a fine fourth placed finish. All six goals arrived in the second-half with Bedford racing into a 3-0 lead in the opening 15 minutes before Tierney Augustine, with a well-taken goal, and top scorer Robyn Gribble reduced the arrears to one. But Bedford broke away to score again in the final stages. Anna Faux won the City player-of-the-match award for a hard-running midfield performance that also featured some fine passing.